Lao Pride Forum - Lao bamboo sticky rice basket with writing "Judy Garland"
Lao Pride Forum › General Category › Judy Garland Board › Lao bamboo sticky rice basket with writing "Judy Garland"
Lao bamboo sticky rice basket with writing "Judy Garland"
We made these traditional Lao bamboo sticky rice baskets and they are absolutely beautiful. The blue letters are not painted onto the basket, but carefully weaved onto the basket. This is a very, very, very skillful technique that is different to normal weaving a bamboo sticky rice basket with only colored patterns. Weaving letters to form words around the basket is the most difficult form of sticky rice making so not everybody can make them. Another hand skill that we possess apart from making ruby slippers. 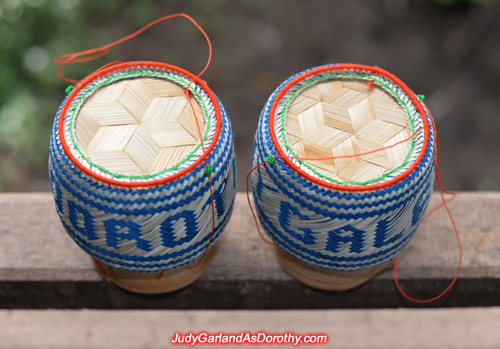 This is the world's first ever traditional Lao bamboo sticky rice basket weaved with the name "Judy Garland" and "Dorothy Gale" that we made in dedication to the world's most beautiful and greatest entertainer. Re: Lao bamboo sticky rice basket with writing "Judy Garland"
So beautiful and so intricate. How long does it take to make such a pretty basket? How many years of practice to become skillful enough to weave letters? Some people learn quicker than others. It depends on your natural abilities, commitment and your hand-eye coordination. I have been working on it for a few years but on an on/off basis so I'm not the most skillful, but still learning the craft. 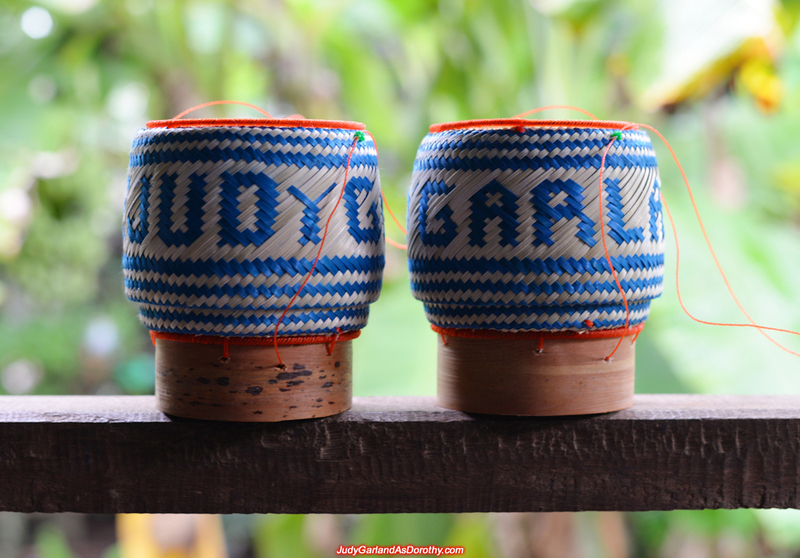 I can make sticky rice baskets in Lao writing, as well as in English. 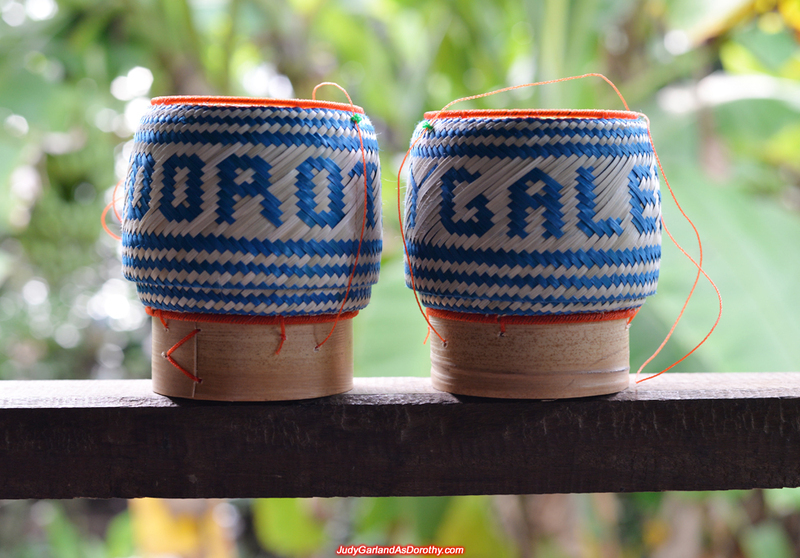 First you need to know how to weave a basic sticky rice basket, then you need to learn how to weave letters on them which is another level up. Admin I've notice your writing skillz are really good. What type of work do you do ? If you don't mind me asking. Thank you, I still have some issues with grammar though. The information about my work is in my profile page. Do you sell those sticky rice basket on ebay ? Laos food is really getting popular. I guess the sticky rice has a lot to do with it. No I don't, maybe in the near future. Can make you make custom basket for sale? What dimensions can you weave from small to large e.g. ; 4 inches - 16 inches? If someone is prepared to pay a few hundred dollars for a custom sticky rice basket with a writing or pattern of their choice then I will certainly consider it, but I won't be doing it for a few dollars. I don't want to make something and then sell it for peanuts, it's not worth my time. you sell them in the $20 and you sold like 10 that would be like $200 bucks. Think of it in quanity.The reason why I said that is . I remember seeing a show about poor people in Africa. They had no jobs and no way of making money.But they knew how to make little necklace and bracklet. Well these tourist people help em sold to department store and they were able to have alittle income. Please don't be offended. I'm just making a general statement . Like a lot of the hilltribe are skill weaver and such. If only there was a way to help em bring it to the American market. I wouldn't make 10 sticky rice baskets for only $200. It's already time-consuming to make one basket with words on them. If I think of large quantities, it means I need to set aside time from doing other things and just concentrate on making sticky rice baskets, and all I am earning is about $200 per month or longer from my hard work. The low income earners in Laos would be very happy with that amount per month, but I'm a high income earner. You pay peanuts, you get monkeys. I can't see selling a sticky rice basket for less than $250 USD EACH! Probably around $500 per basket with custom lettering. The Chinese primarily, with assorted Japanese, Westerners, and other wealthy people could afford such a work of art. Ego is a strong motivator in the luxury market and a hand-made, one-of-a-kind custom lettered Laotian sticky rice basket is something one's other rich friends may not have and thus can be shown off.